Untreated acid reflux can lead to complications, including esophageal cancer. Listed below are the ten most often used treatments for acid reflux. This type of drug works by decreasing the amount of acid the stomach produces, and is used to treat conditions in which the stomach produces too much acid and conditions in which acid comes up into the esophagus and causes heartburn, such as gastroesophageal reflux disease, or (also known as acid reflux disease). Axid, Pepcid and Zantac are in a class of drugs called histamine receptor antagonists. They works by decreasing the amount of acid the stomach produces, and are used to treat conditions in which acid comes up into the esophagus and causes heartburn, such as gastroesophageal reflux disease (GERD). 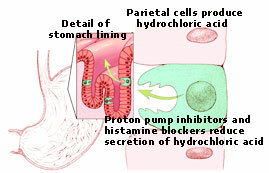 Proton pump inhibitors (PPIs) are a group of prescription medications that prevent the release of acid in the stomach and intestines. Doctors prescribe PPIs to treat people with heartburn (acid reflux), ulcers of the stomach or intestine, or excess stomach acid (Zollinger-Ellison Syndrome). Aciphex, Nexium, Prevacid decreases the amount of acid produced in your stomach. These are used to treat ulcers, gastroesophageal reflux disease (GERD or heartburn). Promotility agents are used to improve GERD symptoms for patients with slow gastric emptying. They speed digestion, which prevents acid from staying in the stomach too long. They may also be used for patients with GERD when therapy with H2 blockers or PPIs does not work. Reglan (Metoclopramide) is in a group called Promotility Agents, and are used to improve GERD symptoms for patients with slow gastric emptying. They speed digestion, which prevents acid from staying in the stomach too long. They may also be used for patients with GERD when therapy with H2 blockers or Proton Pump Inhibitors (PPIs) does not work. Fresh ginger can be ground and added to foods or taken in tea or capsule form. Herbalists recommend consuming 500mg. of ginger with a full glass of water after each meal. Herbal teas containing even trace amounts of peppermint, chamomile, ginger, licorice root and catnip help the stomach lining repair itself. Often, one cup of tea following dinner is enough to stave off future heartburn episodes. Drink at least 8-glasses of water each day to rid the body of toxins and allow your body to expel acid naturally. Papaya enzymes are sold in chewable capsule form, and are taken immediately following a meal with a full glass of water. Consuming more fiber nutrient foods is another natural way to alleviate future suffering. The laparoscopic surgery for treatment of GERD, fundoplication, involves constructing a new "valve" between the esophagus and the stomach by wrapping the upper portion of the stomach (the fundus) around the lowest port of the esophagus. The surgery is conducted under general anesthesia. Small incisions are made in the abdomen, including one to admit the laparoscope or microcamera, which affords the surgeon a magnified, detailed view of the affected areas. If necessary, the surgeon first applies sutures to tighten the hiatus (opening) in the diaphragm, in order to stabilize the stomach and lower esophagus. In the main operation, the adjacent portion of the stomach is wrapped once around the esophagus and sutured in position, creating a one-way valve that allows food to pass into the stomach while preventing gastric contents from backing up in the other direction. Nissen fundoplication is an open surgery procedure requiring an incision 6 to 10 inches long. The hospital stay is about 10 days. Recovery is more painful on account of the large scar, requiring as long as two months. The Enteryx procedure involves the use of a polymer device and a solvent that is implanted in the wall of the cardia during an endoscopy. The aim of the device is to assist in keeping stomach acid in the stomach, and not letting it reflux up into the esophagus. It does this by strengthening the muscle that separates the lower part of the esophagus from the stomach. After this procedure patients may be able to reduce the medications they need to take to improve their GERD symptoms. And in some cases, some patients may be able medications may be eliminated entirely. Using a endoscope, a doctor will inject a liquid polymer into the muscle of the lower esophageal sphincter (LES) by the use of a needle catheter. After the injection, the polymer will solidify into a sponge-like permanent implant. This implant may help improve the barrier between the stomach and esophagus, also called the gastro-esophageal junction, by supporting and improving the elasticity of the lower esophageal sphinter. This will reduce, and sometimes prevent, acid reflux into the esophagus. The Stretta procedure is an approved technique for acid reflux disease. The Stretta procedure uses radiofrequency energy delivered to the lower esophageal sphincter and gastric cardia (uppermost part of the stomach) which improves the function of the LES. This will lead to tissue constriction and will improve the thickness of the muscle wall in these areas. The result of this is a reduction of the frequency of acid reflux because the frequency of LES relaxations is reduced. Also, LES pressure is increased. This reduces the occurrences of refluxed acid into the esophagus. The catheter is placed through the mouth and into the valve between the stomach and the esophagus. The physician then delivers safe, controlled levels of radiofrequency (RF) energy to the LES muscle and the gastric cardia (uppermost part of the stomach) to create thermal lesions. When the lesions heal, the barrier function of the LES is improved reducing the frequency and severity of reflux. The Stretta Procedure is usually performed when heartburn symptoms can't be controlled by medications. The recovery time is brief, and most patients can return to their normal routines the next day. Note: It's important that you discuss any treatment options with your doctor before adopting them.